Alongside her friend and assistant, Cole, Libby must prepare an enormous number of dishes! 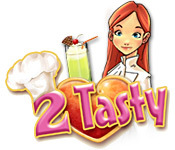 Help this young cook follow the perfect recipes and make meals that are 2 Tasty! Use Libby’s recipes real recipes at home and create her favorite dishes in your own kitchen! Witness the hilarious romantic story between Libby and Cole as you discover the zen of cooking in this fast-paced Time Management game. Cook up food that's 2 Tasty! Travel back to the 18th century and uncover the secrets of bygone days with Golden Trails 2: The Lost Legacy, a fantastic hidden object adventure game and the second title in the Golden Trails series! Romance Of Rome gives you another chance to visit the legendary Roman Empire. Love and treachery, adventure and jeopardy await you in this amazing hidden object game. Find ingredients and juggle hungry customers in this addictive Hidden Object and Time Management game! Trapped at the bottom of the sea by Davy Jones, you must discover his secrets, save your father and find a way to escape!